As we said a goodbye, or should that be a good riddance, to the horrible 2016, I experienced a little glimmer of light by virtue of this excellent and gratefully received review of Holmes Volume 1 from Stacey at The Whispering Stories Book Blog. Sherlock Holmes by Sir Arthur Cohan Doyle, has been brought bang up to date in this remaking of six classic stories written by Melvyn Small. Just like in most of the original books, Sherlock is narrated by Dr. John Watson, who this time is a psychiatrist, rather than a physician. Jeans, hoodie and trainers wearing Sherlock, who is a convicted computer hacker, is solving crimes in his home town of Middlesborough, Teeside, using the same deduction techniques as the original Sherlock. The book starts with the case ‘A Scandal in Boro’, a play on the original story ‘A Scandal in Bohemia’. 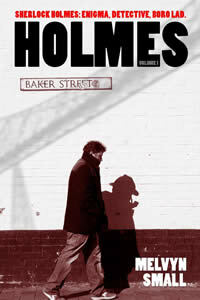 Approached by two FBI agents, Sherlock is asked to locate a stolen file. Hot on the heels of the thief, he meets Irene Adler, but Irene will become known as the only person capable of outwitting him. Throughout the short stories, Holmes and Watson have incredibly dry banter between them, banter that will often have you smirking, if not laughing. The connection between the two is as strong as it is in the original books. The two bounce off one another, especially when they are mulling over cases in the pub, whilst downing many pints of ‘Engineers Thumb’, most often at Watson’s expense. Melvyn Small has also included some of the original characters, such as Inspector Lestrade, Mrs Hudson, and John Openshawe, to name but a few, to give it that authentic feel. The stories are all engaging, and if you have watched ‘Sherlock’ the television programme, you will find yourself imagining Benedict Cumberbatch and Martin Freeman throughout, it’s hard not to. The cases are all interesting. I especially liked ‘The Goldfish Bowl’ with the seven redheaded teenagers, and the game show, or to be more precise, no game show. I’m still in awe as to how Sherlock comes to the conclusions he does, with little to go on. I loved this book, it is one of the best books I have read this year, perhaps helped by the fact that I’m a big Sherlock Holmes fan.